It's cheap, but is it cheerful? We examine the latest controller keyboard from Alesis. Visually, the QX49 makes a good first impression, managing to look clean and functional. Reasonably compact (32 x 9 x 3 inches) and lightweight, due to its all-plastic construction, it has a four-octave, 49-note keyboard. At the left-hand end are pitch-bend and modulation wheels, Octave/Transpose buttons that shift the keyboard's range up or down, in octave or semitone increments, buttons to control various other keyboard functions, and a large and brightly backlit LCD screen. Along the top of the keyboard are, from left to right, eight assignable sliders, four assignable drum/percussion pads, eight assignable knobs, and a set of six sequencer transport buttons (loop on/off, rewind, fast forward, stop, play and record). The back panel provides a pair of five-pin MIDI sockets ( for Keyboard MIDI Out and Computer MIDI Out), a standard USB socket for connecting to a host computer, a socket for connecting a mains adaptor (9V DC, 500mA, not supplied), a three-position power switch (the three positions being USB, Off and Power), and a quarter-inch jack socket for connecting a sustain pedal (also not supplied). The MIDI and mains adaptor sockets allow the QX49 to be used alongside hardware sound sources in a computerless setup, or to serve as a basic MIDI interface for a computer-based studio. The QX49 is a 'class compliant' USB device, so installation ought to be as simple as plugging and playing. My first attempt failed, however, ending in an error dialogue advising me to 'consult with your device manufacturer for assistance'. Fortunately, it worked on the second attempt. The QX49's back panel features a quarter-inch input for a sustain pedal, two MIDI Out sockets, a USB port, a power switch, and an input for an optional 9V power supply. The pleasing look of the keyboard is perhaps slightly let down by its hands-on 'feel'. The QX49 manages to look more expensive than it is, but there are practical limits to the build quality achievable on a product in this price bracket. The top panel above the keyboard, for example, flexes quite noticeably, especially when the drum pads or knobs are in use. It's in no danger of breaking, but it is disconcerting nonetheless, and not the kind of thing you'd find on a more expensive controller. Those knobs work fine, but they also feel slightly wobbly, and the moulding of the plastic caps is a little uneven. One of the QX49's more attractive features is its LCD display. This is large and easy-to-read, and provides useful real-time feedback. For example, press the first of the percussion pads and the screen shows (for example) 'P1 93', P1 being the name of the pad and 93 the velocity value sent. Turn the fifth of the assignable knobs and the display shows 'K5 105', 105 being the MIDI CC value arrived at. The sliders, and pitch-bend and modulation wheels, likewise update the display when tweaked, which makes it easy to keep track of the data the keyboard is sending. The QX49's keyboard has 49 full-sized keys, which feel a bit 'springy', but are basically OK, and certainly comparable to other keyboards in this price range. Usefully, the keyboard can be split into three zones, which may overlap if required, and each zone can be assigned to a different MIDI channel. The buttons beneath the display can be used, among other things, to save keyboard settings to one of 20 internal preset memory slots, from which they can be instantly recalled. The pitch-bend wheel is spring-loaded and produces a sticky kind of 'click' when moved up or down from its centre position, and both it and the modulation wheel are made of a hard plastic that, despite a 'ribbed' surface, still feels slightly slippery. Broad, low caps top the eight sliders, and these work well. They're easy enough to find with your fingertips, and not prominent enough to be at risk of getting accidentally bent. Their travel of just under two inches is on the short side, but they're still quite usable. Most DAW applications include an easy-to-use 'MIDI learn' function that makes assigning controllers near-effortless. If you need to manually assign a controller (for example, when working with hardware sound sources), it's relatively easy. Press the 'Advanced' button followed by middle C (labelled 'Chan Assign'), move the desired knob or slider, or hit the pad that you want to assign, then use the keys at the top end of the keyboard (labelled 0-9 to and 'Enter') to enter the required MIDI controller number. The four drum/percussion pads, whose undersides light up in red when they're activated, are made from a sturdy rubbery material, are square, and provide just enough room for side-by-side fingertips. The pads are velocity-sensitive, but a little on the stiff side: quite a firm tap is required before they trigger, and it's difficult to play notes with a velocity lower than about 50 very consistently. However, there's a mention of a Curve function in the manual, which apparently allows you to "adjust the velocity curves of the trigger pads” as well as, surprisingly, that of the knobs. I was initially puzzled as to how the velocity curve of a knob could be adjusted (some kind of logarithmic rather than linear calibration? ), and to be honest I still am. I'm also puzzled as to what the characteristics of the QX49's different velocity curves are, or even how many are available. The manual is no help: it just says to use "the Keyboard's numeric keys”, along with the Advanced button, and the Curve key, "to enter the new velocity curve number”, which is easily enough done, but it neglects to mention what the valid range of numbers is, or what kind of curve corresponds with what number. I exchanged a few emails on the subject with Alesis' UK technical support, who were polite and courteous... and evidently just as much in the dark as I was. Another pad and velocity-related feature — which I managed to use with more success — is Velocity Lock. This allows you to fix the output from the percussion pads to a constant velocity, which can be useful when, for example, triggering sampled loops that you want to play back at a consistent volume. Velocity-curve confusion aside (a problem of the manual as much as the device), the QX49 is generally quite user-friendly. Assigning controls to instrument or sequencer parameters is straightforward, and after saving a few presets you can switch between controlling different devices and applications quickly and easily. The keyboard is comfortable enough, and quite playable. In view of its low price, the range of assignable controls, and its flexibility, the QX49 looks like good value. M-Audio's Oxygen 49 offers an almost identical feature-set to the QX49 for an almost identical price. Ideally you'd want to give both keyboards a hands-on test drive. Also worth considering is Akai's range of MPK controllers, which provides the same features (and then some), plus superior build quality, but is more expensive. 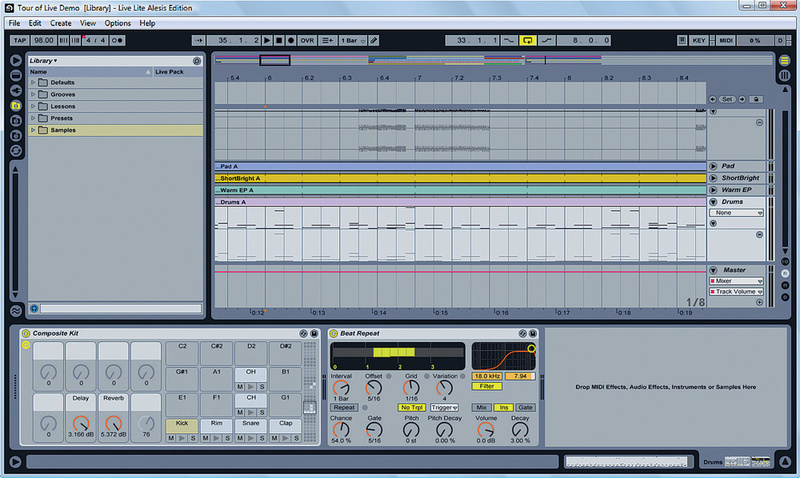 Included with the QX49 is the 'Alesis Edition' of Ableton Live Lite 8, a stripped down-version of the popular Ableton Live sequencing application. 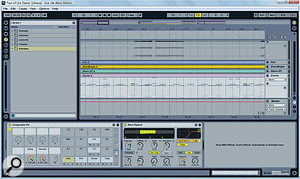 It supports up to eight MIDI and eight audio tracks, and includes a selection of built-in effects and instruments. It's not a replacement for full-blown Live, but is usable and useful nonetheless. A useful selection of assignable knobs, sliders and pads. MIDI ports and (optional) external power allow a variety of uses. A cost-effective controller keyboard, offering a lot of no-frills functionality for the money. User-friendly for the most part, and a good bet for small home studios on a budget.